If you process commissions, you may need to move commission payments from one policy to another. You may need to do this when there is a mistake processing commissions (we’re all human) or there is a duplicate policy. 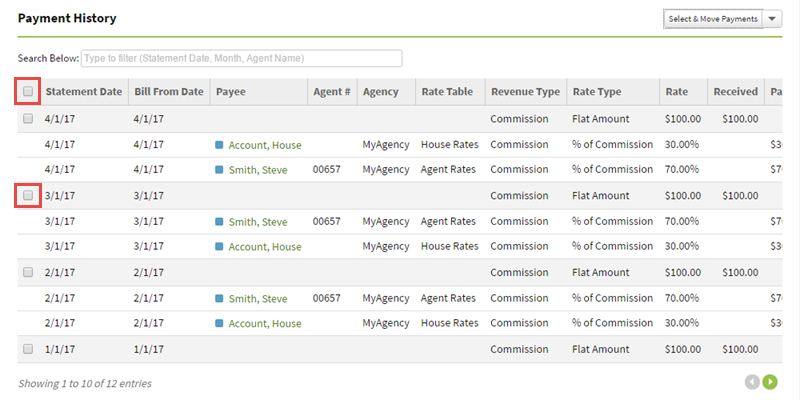 Move commission payments to help manage your commission processing at your agency. 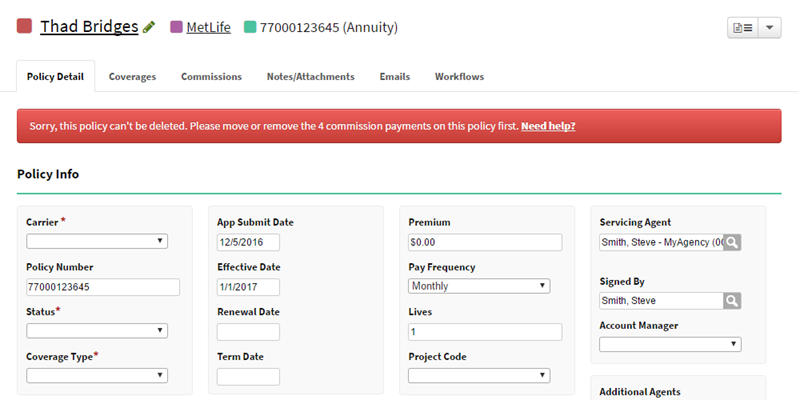 To move commission payments, users need both Edit Commission and Edit Policy permissions. 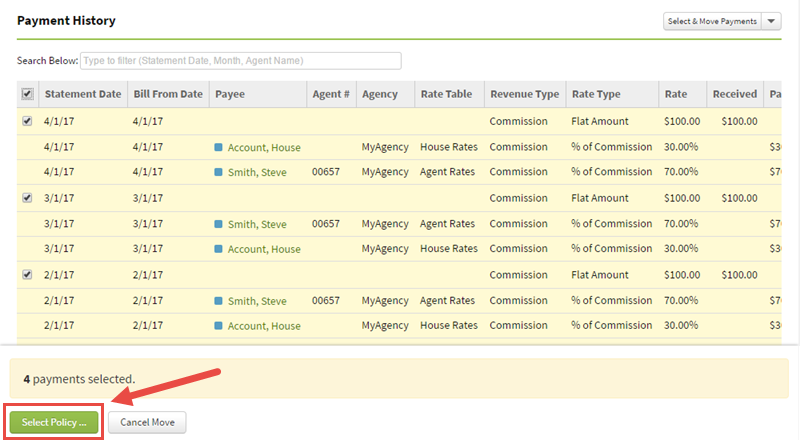 When you move commission payments on a policy, both the commission payment and commissions paid to payees are moved. You can select to move all the payments on a policy or just the ones you want. Choose a policy and then select the Commissions tab. Click Select & Move Payments. Select all payments or just specific payments. 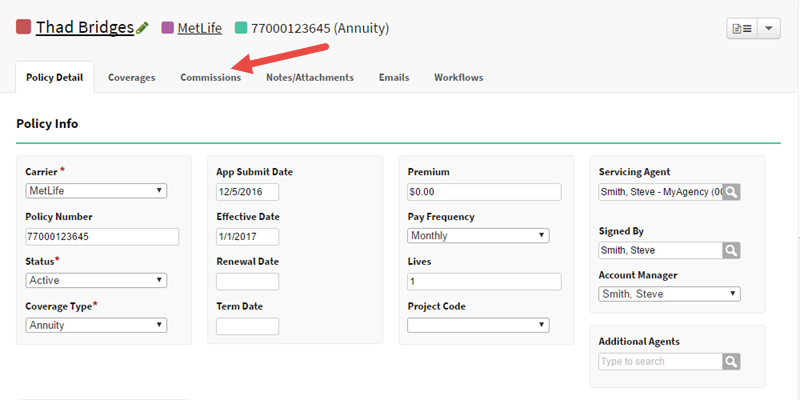 Use the checkbox in the table header to select all payments for the policy or select each payment individually. Review your payment selection and then click Select Policy. Select the policy where you want to move the commission payments. Search for a policy as you would using quick search. Click the select button to move the payments. The payments will be moved over to the policy you've selected. If you are moving payments on a policy, most likely you don’t want future payments to be applied to that policy. As such, to prevent any future payments being applied from an import or relinking, make sure to update the policy number or delete the policy. This will help prevent future payments from being automatically applied to that policy. So before you process or relink any commissions, remember to update the policies you've moved payments on. 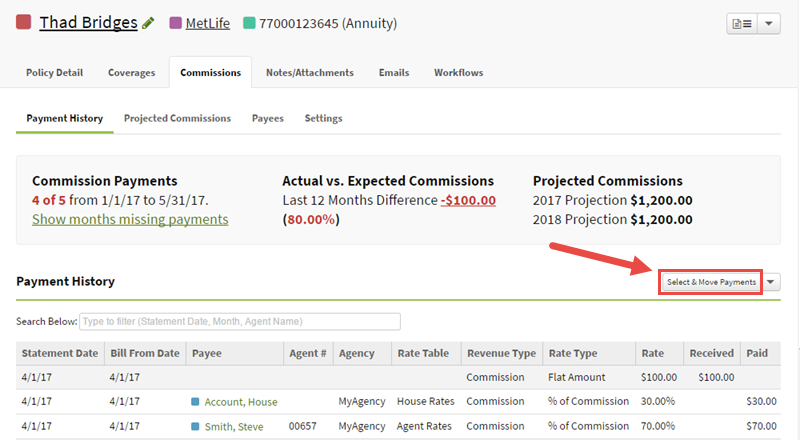 If the policy effective date on the new policy comes after any payment dates, the missed commission payments may not show correctly on the new policy. For example, if the effective date of a policy is 1/1/2017 but there is a payment with the date 12/1/2016. Before you can delete a policy, you’ll need to move any commission payments to another policy. This is to ensure you don’t lose any financial or historical payment data. So, when you need to delete a policy, make sure to move the payments prior to deleting the policy. In the situation where you no longer need the payment history or they were entered in error, you’ll need to remove each commission payment for that policy. Can I undo moving payments? Good question. You can’t undo the move, but you can always move payments back to the original policy.